Old Hollywood glamour isn’t a design theme you’d necessarily expect to find seven thousand miles away from Los Angeles — and particularly not in a city with so rich a history and artistic tradition as Vienna’s. 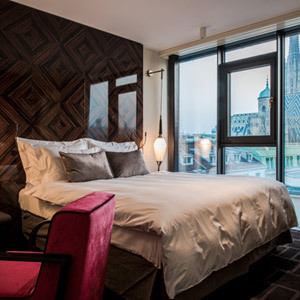 But 1930s-era Tinseltown is indeed part of the aesthetic inspiration at the stylish Hotel Lamée, located across from St. Stephen’s Cathedral in the heart of the historic center. What’s unique here is exactly this alternative brand of glamour — one that’s dramatic and sensuous in a city that’s opulent but comparatively buttoned-up. What’s the Hollywood connection? It has to do with the building itself. Unlike many of the city’s grand old hotels, the structure is relatively new, built in the 1930s. Restoration was put in the hands of a modern, sustainability-minded design group that opted to celebrate the building’s original era instead of mimicking the stateliness of the landmarks in the surrounding neighborhood. 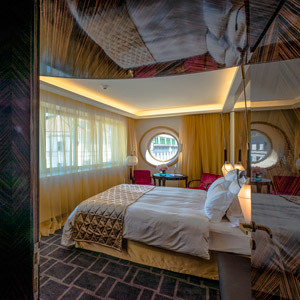 The result is a cool art-deco hotel with a geometric facade, a moody lighting scheme and vintage-inspired fixtures, romantic velvet ottomans, retro veneers and credenzas made of shiny dark wood. Guest rooms and suites feature modern marble bathrooms and luxurious beds — despite appearances, the sleek furniture and plush linens were made with green materials — the kind of place where you might be tempted to hole up all day, movie star–style, making a late-morning coffee with the Nespresso machine or raiding the minibar while watching movies on the HD screen. Downstairs, a gourmet breakfast buffet — and later in the day, modern takes on classic Austrian dishes — are served in the hip two-story Bloom café. 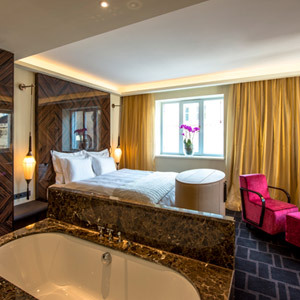 But the hotel’s most spectacular space is upstairs: the rooftop terrace, overlooking the spires of the cathedral and the gilded architecture of old Vienna, is a perfect spot to order a bottle from the eco-friendly wine list and watch the sun go down. Access to Privileged Club Services. 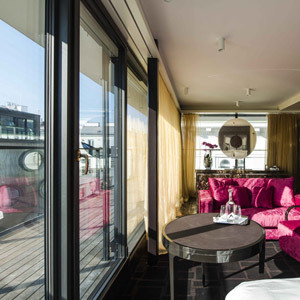 Suite features either a terrace or floor to ceiling windows.